Stovetop Girl - ZineWiki - the history and culture of zines, independent media and the small press. 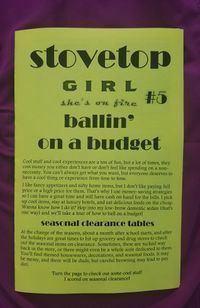 Stovetop Girl, subtitled She's on Fire, is a series of zines by Kari Tervo. The series currently has five issues. Tervo explains in the introduction to issue #1, "My goal with Stovetop Girl is not to have a goal. Maybe I'd just like to talk about something for a quick second, or show you something neat." The series will contain quick rants, anecdotes, show-and-tell, photos, and whatever else seems cool to share. Issues #1-3 and #5 are four pages each, while issue #4 is 12 pages. 1, September, 2014: Gift-giving at "conscious parties," some photos from the hardware store. 2, September, 2014: Some ways Beverly Hills is just like Dodgeville, Michigan, plus a short story called "The Perrier Principle." 3, October, 2014: The Lottery: A Winning Losing Proposition. 4, May, 2015: 1990s Relics. According to Tervo, upcoming issues will cover this, that, and the other thing. There is a plan for extensive coverage of miscellaneous. Ken Bausert reviewed Stovetop Girl #5 in Xerography Debt #41, stating that the zine is "presented in a lively and light-hearted way. . .a fun read for sure." In September, 2015, Stovetop Girl was awarded a Laureate Award for Best New Journal by the American Amateur Press Association. Stovetop Girl #1 was part of the October, 2014 mailing of the American Amateur Press Association. Stovetop Girl #2 was part of the December, 2014 mailing of the American Amateur Press Association. Stovetop Girl #3 was part of the July, 2015 mailing of the American Amateur Press Association. This page was last modified on 11 February 2018, at 22:38.